Recently I’ve been reading The Three-Body Problem by Cixin Liu (and I may talk about it later, if I feel masochistic enough to take a look at this year’s Hugo Award nominees), and in one of the early chapters there’s a footnote referring to today’s short story. I couldn’t remember much about it aside from its broad outline, so it’s as good an excuse as any to revisit the piece. Professor James Priss is a slow but brilliant scientist. He has discovered theoretical marvels and been awarded two Nobel prizes, but all this comes from a ponderously methodical nature, and in person he seems to lack any mental agility at all. Add to this habit of speech a bland countenance, rather pale, with no expression except for a general look of uncertainty; gray hair, rather thin, neatly combed; business suits of an invariably conservative cut; and you have what Professor James Priss was – a retiring person, completely lacking in magnetism. That’s why nobody in the world, except myself, could possibly suspect him of being a murderer. And even I am not sure. After all, he was slow-thinking; he was always slow-thinking. Is it conceivable that at one crucial moment he managed to think quickly and act at once? Edward Bloom is almost his opposite, both in demeanor – a boisterous showman – and in scientific acumen. Fohile Priss is the theoretician, Bloom is the one who can turn these theories into practical, commercial applications. By harnessing these innovations Bloom has made himself one of the richest men in the world; and while Priss has not gone unremunerated for his work, he is by no means wealthy. So while the two of them claim to be friends and play billiards every week (Priss says he regularly beats Bloom, which the latter angrily denies), there is a certain amount of tension about them. This only heightens when a reporter asks Priss whether he believes an anti-gravity device is possible, which Bloom’s company has been trying to build. Priss says it is theoretically impossible, and Bloom takes this as a personal challenge to prove him wrong. A discussion of the science of anti-gravity ensues. 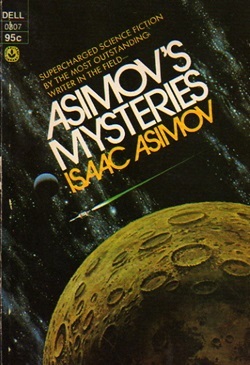 In the introduction Asimov comments that this is likely the only murder mystery to make use of Einstein’s theory of relativity, and as it features in the dénouement, this is a necessary piece of exposition. Besides, Asimov is excellent at describing scientific ideas in clear terms, and even if you don’t quite follow what he’s describing, the interplay between Priss and Bloom ensures you’re still invested in the outcome. As time goes on Bloom’s devices are able to decrease the local gravity in an area, growing ever closer to true anti-gravity, and eventually he announces complete success. He plans to hold a public demonstration with Priss as the guest of honor; humiliating the theoretician like this will conclude their rivalry once and for all. Bloom even designs the anti-gravity device to resemble a billiard table, which should levitate a billiard ball slowly into the air.